"We are closely monitoring the situation and we stand ready to assist the people of Haiti," President Obama said in a statement. I love this statement. Is it generic and the correct thing to say in response? Sure. But often the "right things to say" are right for a reason. And for one, I second that response. 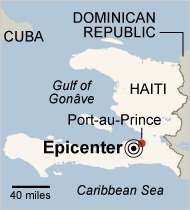 A powerful earthquake of 7.0 magnitude rocked Haiti just before 5 p.m. Eastern time, 10 miles southwest from the highly populated capital of Port-au-Prince, according to the United States Geological Survey, causing widespread damage and panic with the potential for a high number of casualties in the impoverished Caribbean country. There were two aftershocks — of 5.5 and 5.9 magnitude — that followed in the last hour, and more were expected, according to David Wald, a seismologist with the survey. The city has about 2 million people, according to National Geographic. According to several news reports, a large hospital in the capital had collapsed, and people were screaming in streets full of rubble.